Eco-Block™ by Pond Biologics® is a ceramic media compound with an exceptionally high surface area, which gives beneficial bacteria an area to function and promote reproduction. Establishing and maintaining higher colonies of active bacteria is essential to keeping a pond healthy. A one pound Eco-Block™ contains 15,000m2 of surface area, accelerating up to 5X the proliferation and continued growth of beneficial bacteria. Eco-Block™ helps establish more bacteria colonies than any other media product on the market, which in turn reduces the time that these bacteria need to form functioning colonies which are necessary to assist in reducing unwanted organic buildup and nutrients. Apply the small packet of starter bacteria to a bucket of pond water. Leave Eco-Block™ in the provided mesh bag and soak the Eco-Block™ in the bacteria with water solution for a minimum of three hours. Be sure the Eco-Block™ is fully submersed. It is recommended that the Eco-Block™ be placed in an area of flowing water. Place inside of a pump vault, waterfall filter box or external pond filter. This will ensure that beneficial bacteria is carried throughout the entire pond. Earthen/Farm Ponds: Use ten Eco-Blocks™ per ¼ surface acre. For best results, hang from a dock, under a floating fountain, or suspended from a buoy over an aeration system bubbler. 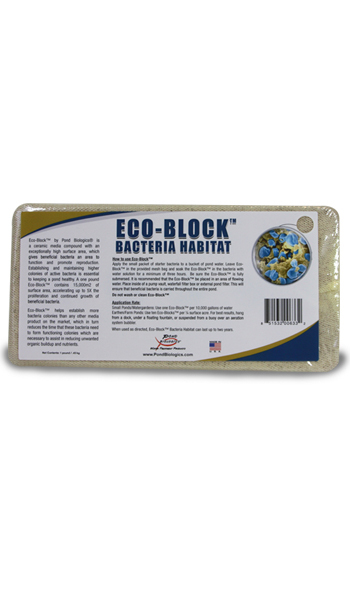 When used as directed, Eco-Block™ Bacteria Habitat can last up to two years. For best results apply Bio-Shock™ as an initial treatment as soon as the weather permits and continue maintenance treatments with Pond Biologics® microbial products on a regular basis.